In its continuous efforts to promote and foster intra-trade development, the International Islamic Trade Financing Corporation (ITFC) (www.ITFC-IDB.org), member of the Islamic Development Bank (IDB) Group, organized its first African-Asian Cotton B2B Meeting event as part of its Cotton Development and Partnership Program. The Meeting took place in the Westin Hotel, Dhaka, Peoples’ Republic of Bangladesh. The event was inaugurated by the Minister of Finance, Mr Abul Maal Abdul Muhith; Government of the Peoples’ Republic of Bangladesh and Chairman of the IDB Board of Governors and Eng. Hani Salem Sonbol, Chief Executive Officer, ITFC. The meeting also witnessed the attendance of West African cotton producers, the African Cotton Association, the Bangladesh Textile Mills Association, the Bangladesh Cotton Association, and Bengali Spinning/Textile Mills. The Meeting supports in the first place the Bangladeshi textile industry, which is the source of employment and export earnings for Bangladeshi economy. 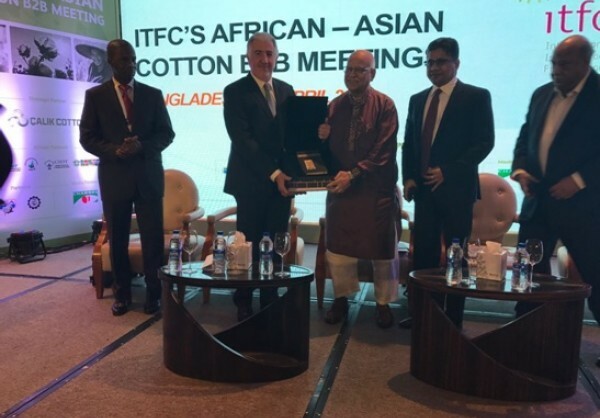 ITFC was able to bridge between the Asian countries, specifically Bangladesh and Indonesia, to reach out and develop new business partnerships with African cotton suppliers. Eng. Hani Salem Sonbol, CEO ITFC expressed his special thanks to the President of African Cotton Association, Mr. Baba Berthe and CEOs, representatives of West African Cotton Ginning companies for being part of this B2B Meeting, which ITFC is co-hosting with the Bangladesh Textile Mill Association and Bangladesh Cotton Association. He went on to say, “ITFC is very thankful to its strategic partners for co-hosting this important business development event for OIC’s cotton industry. From his part, Mr Abul Maal Abdul Muhith expressed his confidence in the impact of this meeting to the Bangladeshi’s to the textile and garment industry, which is the backbone of the Bangladeshi economy and stimulator of its economic growth. “This meeting opened doors to our cotton importers to build new opportunities with the African suppliers. With the current challenging economic environment and the increasing competition, ITFC had given us the chance to reach out to new destinations,” he said. Calik Cotton, sponsored the meeting as the event’s strategic partner. Calik Cotton supplies cotton of different origins grown both in Turkey and abroad and serves major local and international textile industrialists. Moreover, this event serves as a platform for networking and business partnerships, and provides an opportunity for discussing ideas, industry trends and market updates.